I’m very fortunate to live in an area where quilt guilds are plentiful. Quilt Guilds are a great place to meet fellow enthusiasts. Not all quilters or Quilt Guilds, for that matter, are alike. Theoretically one could divide Guilds into at least two categories, traditional and modern. In my opinion, Traditionalists tend to use more structure in their expressions of art. They follow a prescribed set of rules that determine the exact size and shape of their creations. Modernists, on the other hand, tend to think more outside the box. Their creations are less structured, more free-flowing. I belong to three Guilds; two Modern and one Traditional. Today’s focus will be on the Madison Modern Quilt Guild. I joined the Guild back in September of last year. My oldest daughter was the driving force behind the discovery. She is definitely a modern quilter. She thrives in the area of free-form quilting. 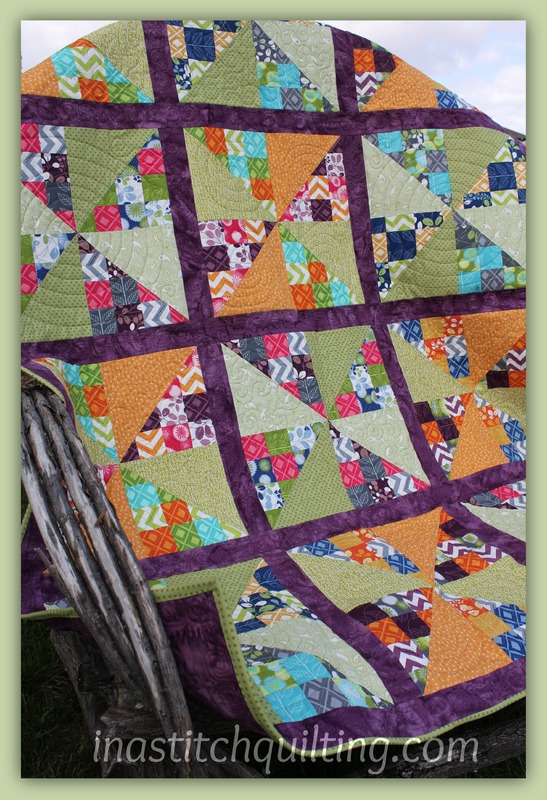 Constructing a quilt with perfectly aligned blocks and points would drive her bonkers. As its name would suggest, the Madison Modern Quilt Guild meets in Madison, Wisconsin. Their meetings are held at the Sequoia Library on the last Wednesday of each month. What began as a groups of friends gathering together has mushroomed into an ever-growing body of women. At any given meeting it’s not unusual for five or more new faces to appear. While not all participants are modern quilters by practice, I believe they have a desire to learn and grow in that direction. as well as the quilts shown in this slideshow. If you have the opportunity to visit the library before June 30, 2013 I’m sure you will be delighted with the wonderful display. This brings to a close another edition of my Friday Favorites. Come on back next Friday for another visit. Interesting reading! Thanks for sharing. You are very welcome. Have a great weekend. You forgot to label the photo of one of the other quilts you quilted! :0) your pictures turned out wonderful – such a tough room to take pictures in. I realized that afterward. Oh well! Thanks!